That being said, you still have to go through the process of finding and buying your dream home in the area. 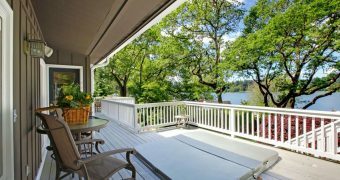 If you’re considering purchasing a lakefront property, there are several expert tips that will help you prepare for the process. Keep reading for some useful insider must-knows. When you approach a gorgeously structured waterfront house, it’s easy to miss out on other important aspects of the entire property. Lovely features within the home can distract you from the steep, precarious stairs leading down to the water’s edge or the mucky swimming waters leading up to the property. It’s important to take note of what the property offers outside of the home. How are the views? Is there enough privacy? Is everything fairly accessible? If there’s a lot of work to be done in order to make the property satisfactory, you might want to consider checking a few other homes out. When looking at lakefront properties, consider how each one might complement your lifestyle. Maybe you love to fish, but the property you’re interested in is a good distance away from decent fishing waters. This could make a difference in how often you get a chance to participate in an activity you love. Think about the hobbies and activities you care about and search for a property accordingly. It’s always important to purchase a home that is structurally sound. This can help you avoid huge repairs and costs in the future. However, this tip is especially important for lakefront homes. Houses on the water tend to experience more from the elements than other homes. Check to see if a property you’re interested in has features that can help it withstand the weather. Also look for any degree of damage that could cost you in the long run. Waterfront Williams Lake real estate comes with certain responsibilities and freedoms. If there are changes you want to make to the property, make sure that they are within your rights. Adding a dock or seawall may be allowed, but some areas could have restrictions on certain types of watercraft like jet skis. It’s important to check with your real estate agent to see if you can do everything you’d like to on your property. Also, if there’s a homeowners association, make sure you review everything that’s expected of you in terms of your property’s maintenance and upkeep. This can help make your decision a little clearer. Lastly, hiring a real estate agent that specializes in the buying and selling of lakefront properties will help make the process much simpler. If you’re considering buying a home on WIlliams Lake, the realtors at Team Moore will be there for you. For advice on how to get started, contact us today!